All Saints' Day falls on November 1st each year and celebrates all the Christian saints and in particular, those saints that have no special feasts or days of their own. People will attend church services and pray for the dead including the past Saints'. Many will visit cemeteries to acknowledge and pray for the dead. 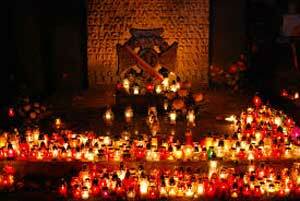 Pope Gregory IV in 837 made all Saints' Day an official holiday. There is speculation about the event being held on November 1, which is the same day as the pagan Festival of the Dead, which would compete with All Saints' Day. Others say, All Saints' Day got its start back in the fourth century where Greek Christians celebrated a festival on the first Sunday after Pentecost in honor of Saints.